PetTest Blood Glucose Meter is a simple device for testing the blood glucose of your pets. 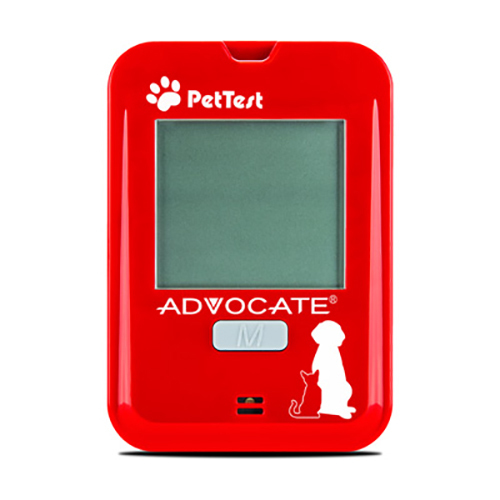 The PetTest Glucose Meter was designed specifically for dogs and cats, assuring the most accurate readings. 1. Insert the test strip into the strip port. Meter will turn on automatically. 2. Select the correct mode for your dogs and cats by pressing the M button. 3. Apply blood from your dog or cat. Results will be displayed on the screen in five seconds. This device is for use under the direction of a veterinary professional. Home testing results do not substitute for veterinary advice. For in vitro diagnostic use only for dogs and cats, not intended for human use. Do not use strips after expiration date.